At Rainforest Cruises we often receive enquiries about the best way to combine Machu Picchu with an Amazon Tour. Adding an Amazon River cruise with a visit to Peru’s historical capital, Cusco, and its nearby star attraction, the ancient Inca citadel of Machu Picchu, is an ideal itinerary. If you’re looking to compliment an Amazon river cruise with a land-based experience taking in more of Peru’s highlights, then look no further. We’ve gathered all the information you need in one place, from advice on when to visit and how to travel, to accommodation options and an overview of what not to miss. What’s the best way to approach this trip of a lifetime, taking in two of South America’s most iconic destinations? We recommend an itinerary along the following lines. First off, fly into Peru’s bustling capital city, Lima. To embark on the Machu Picchu leg of your adventure, take an internal flight from Lima to Cusco using a domestic airline such as LAN. Then you’ll head straight into Peru’s mesmerising Sacred Valley, giving you plenty of time to acclimatise before heading to the main attraction, Machu Picchu, high up in the Andes. Return to Cusco and spend some time exploring the highlights of this ancient city, before catching a flight to Iquitos and starting your Amazon adventure. You’ll then fly from Iquitos to Lima, before connecting with your international homebound flight. Read on for plenty more details on what you can expect from this whirlwind tour of Peru’s highlights! Upon arrival in Peru, begin your fascinating tour through the remnants of the ancient Incan empire with an exploration of the beautifully-preserved old capital city of Cusco. This famed city is home to an astonishing array of historic and archaeological treasures just begging to be explored, including the Plaza de Armas, the impressive cathedral and the Qoricancha sun temple. After exploring the main sights, head to the atmospheric San Blas neighbourhood, populated with artists’ studios and trendy bars, and for sweeping views over the city take a trip up to the Sacsayhuamán ruins. At the end of the day, unwind and explore Cusco’s thriving culinary scene, dining in one of the many fine restaurants that populate its historic centre. After soaking up the rich heritage of Cusco, descend into the ancient Incan heartland of the Sacred Valley, an area of lush foothills, fertile farmland and picturesque settlements that’s filled with countless archaeological and cultural highlights. The area has its fair share of Inca citadels, as well as numerous trails awaiting exploration. Highlights include the salt mines of Maras, the colourful market of Pisac and the impressive ruins of Ollantaytambo. This portion of the trip provides the ideal opportunity to acclimatise to the altitude before heading further up into the Andes. The tour has been especially designed to take into account slow acclimatisation to altitude as you gradually work your way from the spectacular Sacred Valley, to the magical archaeological site of Machu Picchu and end in Cusco, Peru's Inca capital city. Widely regarded as one of the greatest archaeological wonders of the world, this awe-inspiring ancient Inca settlement is a definite highlight of any Peru tour. The well-preserved stonework, stunning backdrop and enigmatic aura of the site draw visitors in their thousands each year. Catching your first glimpse of the terraced ruins, set against a breath-taking backdrop of towering emerald peaks, is a moment you won’t forget in a hurry. If you’ve got an appetite for adventure, hike the 33 km Inca trail high up into the Andes, traversing lush rainforests, raging rivers and high mountain passes, before receiving the ultimate reward for your efforts – several hours spent basking in the glory of one of the greatest wonders of the world. As one of the most visited sites in Peru, a tour of Machu Picchu will help you get in touch with the spiritual road of the Incas and trace their archaeological legacy. At 2,340m above sea level, the site encompass both the mountainous terrains of the Andes and the tropical jungles and forests of the Amazon. Built in the 15th century, the historic site is set within a completely natural environment, with peaks, valleys and mountainous slopes filling the landscape that surrounds city. No wonder Machu Picchu is listed on so many travelers' bucket lists, a tour of this Inca citadel is truly an experience of a lifetime. Rainforest Cruises always advises travelers to use a private guide and to arrive to Machu Picchu in the afternoon, as most tour groups crowd the site in the early mornings. You’ll embark on your Amazon river cruise from either Iquitos, or from the nearby port town of Nauta. Peru is home to the Amazon headwaters which are said to contain a greater concentration of wildlife in comparison to the lower-lying portions of the Amazon, making it a great choice for those eager to spot a wide array of species. Peru also harbours great swathes of remote forest still relatively untouched by human settlement and where it’s easier to spot some of the jungle's most unique wildlife. Look out for pink river dolphins, three-toed sloths, capuchin monkeys and the notorious anaconda snake. It’s also the destination of choice if you’re interested in cultural encounters with the many indigenous communities that reside in this part of the Amazon. Some allow visitation, others prefer isolation. One of the best reasons to come to the Peruvian Amazon is to explore Pacaya-Samira National Park, one of the most pristine, biodiverse and beautiful areas of the entire region. Nicknamed the “jungle of mirrors” due to its vast tracts of flooded forest, this reserve is home to a stunning collection of flora and fauna, from river dolphins, monkeys, and macaws, to exotic birds, caimans, and plenty more. Pick from an array of Amazon cruise options available anywhere from 3 to 8 days. Each provides an unforgettable journey along tranquil waterways, as well as numerous outings on skiffs to enable you to explore narrow tributaries, waterlily-filled lagoons and get up close to the wildlife. Cruises also offer plenty of adventure activities to enhance the experience, whether it be piranha fishing, kayaking, canopy walks, bird watching, or nocturnal wildlife-spotting excursions. There’s simply no place on earth like the Amazon rainforest. Vast endless expanses of trees and lush vegetation, the largest concentration and diversity of wildlife to be found anywhere, and of course the mighty Amazon, its tributaries and multiple connecting waterways that are all begging to be explored. Whilst many people equate the Amazon with Brazil, there are plenty of fantastic reasons to choose Peru for your Amazon adventure. First, you’ll get the chance to experience one of the Amazon’s most exciting cities, Iquitos – a remote yet bustling hub of activity that’s the perfect introduction to the region. Iquitos is the largest city in the world that is only accessible by boat or plane. You’ll find plenty to occupy your time in this jungle city, either before or after an Amazon cruise. Spend time sampling Peru’s world-famous cuisine in the street markets, hidden local eateries or acclaimed restaurants. Wildlife enthusiasts will want to visit the Manatee Rescue Centre and the Pilpintuwasi Butterfly Farm, both located just outside the city. There’s also plenty of history, architecture, culture and art to soak up in the city’s museums, markets, landmark sights and plentiful souvenir shops. The temperature in Machu Picchu remains within a fairly narrow and comfortable band of between 50 F (10 C) and 80 F (27 C) year-round, so at no times will you be subject to extreme temperatures – especially good news for those hiking the Inca trail! Peru does, however, have a dry season and a rainy season that may influence your choice of when to travel. The consensus in the travel community is that the best time to visit Machu Picchu is during the South American winter (the dry season) which runs from May to September. We also also advise the shoulder seasons of May and September to avoid crowds. During this time, there’s very little to no precipitation, along with slightly lower temperatures. All roads up to the ancient Inca site are open and you can expect endless days of clear blue skies.Having said this, the distinction between the two seasons isn’t always so clear-cut. The wet season runs from October through to April, but the rains do not usually become a problem until January. This means the shoulder season is another popular time to travel to Peru. December, in particular, is still an excellent time to visit, popular with Christmas and New Year travel, with sporadic rains, pleasant temperatures and fewer crowds. Also bear in mind that the weather up in the mountains can be especially unpredictable, with the possibility of mist and fog surrounding the sites at any time of year. This region of Peru is also home to several memorable events that may be worth planning your travels around. A host of fantastic celebrations take place during the dry season, including the impressive Inca Festival of the Sun held in June, as well as Peru’s Independence Day in late July. However, there are plenty of festivities taking place year-round as well, notably the Lord of the Earthquakes Festival held around Easter each year, as well as the mesmerizing 'Santuranticuy' Artisan Crafts Fair taking place just before Christmas, both held in Cusco. So, all in all (with the possible exception of January and February) we would say there’s no real off-season or “wrong” time to visit Machu Picchu! The Amazon is another great year-round destination, with fairly stable weather conditions characterised by rain and hot temperatures no matter which month you travel. In a typical year, there are around 200 rainy days and temperatures in Iquitos and the surrounding Amazon rainforest range from 70 – 91 F (21 – 33 C). However, the time of year you choose to visit will have a significant impact on the type of experience you have. This is because the Amazon region experiences a flooded season and a dry season, with water levels being significantly higher in one than the other. The wet or high water season (December to May): This is the Amazon’s summer season, when you can expect cooler temperatures, more humidity and a bit more rainfall compared to the rest of the year (but only about 10% more). The Amazon waters are higher during this period, reaching their peak in May, when they can rise nearly 25 feet above dry season levels. However, this is largely due to water runoff from the Andes rather than significantly more rainfall in the Amazon itself. 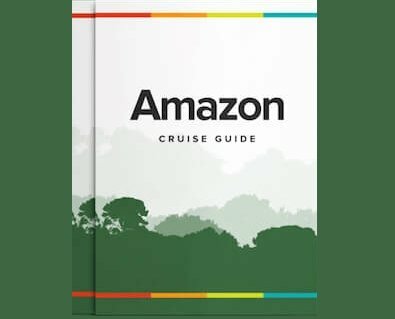 So what does this mean for an Amazon cruise? The big advantage is that you’ll be able to navigate narrow rivers, creeks and shallow lakes that would otherwise be inaccessible, taking you deeper into the jungle environment and closer to its incredible flora and wildlife. The higher water level also places you much closer to the rainforest canopy, making it easier to spot monkeys, birds and many mammal species. The dry or low water season (June to November): Winter in the Peruvian Amazon offers higher temperatures and more clear sunny days, as well as fewer mosquitoes! However, this is still the rainforest, and you can expect days of heavy rain even during the so-called dry season. The major advantage of taking a river cruise in the dry season are the opportunities for land-based explorations, with numerous jungle hiking trails opening up. The lower water levels also make it easier to spot animals in the water, particularly reptiles, try your hand at fishing and admire huge flocks of migratory birds. Overall, both seasons in the Amazon are fantastic times to visit, though they do each offer slightly different perspectives and experiences. If you can’t make up your mind and this is your first time visiting, we suggest starting with a cruise in the wet season, as this also coincides well with the peak time to visit Machu Picchu. We recommend spending at least 11 days to complete a tour of Machu Picchu and the Amazon. This would involve spending 4 to 5 days exploring Machu Picchu, Cusco and the Sacred Valley, before flying to Iquitos to embark on a 5-day cruise of the Peruvian Amazon, plus a travel day. This is the bare minimum amount of time you’ll need to complete the itinerary. But of course, with such world-class destinations on your hands, we think the more time you can spend getting to grips with these wonders, then all the better! Travellers arriving from North America can fly with American Airlines, LAN Airlines, Avianca and United Airlines, with flight times ranging from 6-9 hours depending on your city of departure. Popular choices for European travellers are KLM, Air France, Iberia, LAN and Air Europa. There are plenty of direct international flights from North America, one-stop connections from Europe, two-stop flights from Asia and Australia, as well as many low-cost regional flights from other South American cities. Machu Picchu is situated high above the Urubamba Valley in the Peruvian Andes. It’s accessible from the beautiful city of Cusco, which in itself is a must-visit of any Peru tour. The ancient Inca citadel can be reached by train or on foot via the spectacular Inca Trail. The option you choose will obviously be dependent on your time constraints, energy levels and appetite for adventure. If you’re operating on a tight itinerary, you’ll want to take the train straight up to the ruins from Poroy Station in Cusco. Travellers often combine a trip to Machu Picchu with a tour of the mesmerising Sacred Valley, which begins just 15 km outside of Cusco. If you’re heading out to the Sacred Valley before visiting Machu Picchu, then you can catch the train up into the Andes direct from Ollantaytambo Station. Iquitos is the gateway to the Peruvian Amazon, and a hub of river cruise activity. You will either embark on your cruise direct from here, or from the nearby port town of Nauta which is a straightforward 2-hour journey south via private car or speedboat. Due to its remote location, there is no road access to reach Iquitos itself. Most visitors fly in, although there is also the option of arriving by boat. International flights arrive through Peru’s capital city, Lima, a journey of less than two hours. You will then be transferred directly from Iquitos airport to your cruise vessel. If you’ve got time to spare and fancy taking to the water early, it’s also possible to reach Iquitos from places along the river including Caballococha, Yurimaguas, Contamana, and Requena. You can take a large tourist boat, a regular public transport vessel, or a motorised canoe, and expect the journey to last from anywhere from 19 hours to 7 days. For the Peru leg of the trip, there are some world-class accommodation options in Lima, Cusco and the Machu Picchu area. For a taste of luxury in Lima, stay at the 5-star Westin or the Belmond Miraflores Park Hotel. They will exceed all expectations in terms of facilities, services and creature comforts. Both offer spacious rooms, unbeatable settings, sleek swimming pools, outstanding views and tantalising cuisine. If you’re after a more authentic Peruvian experience, opt for one of Lima's charming boutique hotels, such as Second Home or Hotel B, both renowned for their warm hospitality, inspired decor and impeccable service. Our picks for Cusco are, Inkaterra La Casona, Palacio Nazarenas, Casa Andina Private Collection and Tierra Viva Hotel. If you plan to stay overnight in the Sacred Valley, we recommend the luxury hotel Belmond Rio Sagrado or Tambo de Inka for pure decadence and unbeatable settings. For a more affordable option, Casa Andina Private Collection boasts an impressive range of modern amenities including a gym, spa, planetarium and upscale restaurant, not to mention beautiful gardens and stunning mountain views. An excellent choice for hotels in the Machu Picchu area is the Inkaterra Machu Picchu Pueblo. Named amongst National Geographic’s Unique Lodges of the World, a stay here offers the perfect combination of luxury and immersion in the stunning natural surrounds. Upon arriving in the Peruvian Amazon, you may choose to spend some time exploring Iquitos. Accommodation options are plentiful, ranging from luxury stays to family-friendly hotels and romantic getaways. If you’re looking for something special, La Casa Morey provides beautifully-appointed rooms in a large historic mansion on the banks of the Amazon. The elegant dining room and bar, soothing pool and tranquil courtyard provide the perfect place to rejuvenate in-between taking in the thrills of the city. A great option for budget travellers is La Casona Iquitos, a friendly place offering comfortable rooms, a central location, inspiring local artwork and communal areas to mingle and relax with fellow guests. Alternatively, many travellers choose to combine a river cruise with a stay in a unique jungle lodge. This provides the best of both worlds, enabling you to experience the breadth and diversity of the Amazon on a cruise as well as immerse yourself in the intricacies of daily jungle life. Our top pick is The Treehouse Lodge, a unique canopy-level style accommodation perched up to 67 feet above the ground. Situated in the heart of a pristine jungle reserve, you’ll spend your days surrounded by exotic fauna including monkeys, sloths, toucans and macaws. The 8 ensuite bungalows are exceptionally comfortable and connected to dining, bar and lounge areas via a series of suspended pathways and bridges offering stunning panoramic views. This is the perfect place to base yourself to sample delicious Amazonian cuisine, try your hand at countless adventure activities and experience jungle life at its most exceptional. Peru also happens to offer the very best in luxury Amazon river cruising. If you’re looking to journey into the wildest depths of the rainforest all whilst retaining the highest level of comfort and service, then take your pick from our top luxury cruises. Aboard all these vessels, you can expect handsomely-appointed cabins with personal balconies and panoramic windows, spacious lounge and dining areas, and an inviting sun deck often with the addition of a plunge pool or Jacuzzi. You’ll also be treated to some of the Amazon’s top guides, some of the region’s best adventure excursions, as well as a mouth-watering selection of regional and international cuisine.